My child is a picky eater. He's not the average picky eater, either. It's extreme and always has been. It's difficult to deal with and often makes me feel like a failure as a parent. I've admittedly made poor choices as a parent in this department. I've never been the "eat it or starve" kind of mom and preparing the weeknight family meal that everyone loves has never been my strength. I never required my kids eat all their vegetables or clear their plate. I have been lax in this area and I know those parenting choices play some role in my child's picky diet. There's been a thousand things that we could have done differently, but sometimes I wonder how much being more strict about food would have helped. He was born picky. When he was a toddler I was told it was a texture issue and to just give it time. When he was younger we just let him eat the things he liked because we didn't want him to be hungry. He's basically survived on ramen noodles for 9 years. When he was four I took him in for some routine blood work. His picky choices were so extreme that I worried he might not be getting all the nutrients he needed. I wanted some numbers to assure me he was OK. The results of the blood work came back fine. His levels were healthy, but we got one unexpected surprise. He has a severe peanut allergy. On a scale of 1-6 my son has a class 6 peanut allergy. All I could think about were the dozens of PB&J sandwiches I'd offered him over the years. As a mom of a picky eater, peanut butter was always my go-to solution for protein that he thankfully never took me up on. Peanut allergies weren't something that anyone on either side of our families ever had to deal with it. In that moment, I was glad he was a picky eater. Maybe it was God's way of protecting him? Perhaps his body had it's own natural instinct? We got our EpiPen and headed on our way. That was five years ago. Thankfully, we've never had any emergencies. In fact, his peanut allergy has been so uneventful (for lack of better word) that I questioned the results of that first round of blood work. For an already extremely picky eater, tossing a fatal food allergy into the mix only made things harder for him. Just a couple of years ago I decided to have him retested. In all honestly (and desperation) I thought that the results would come back negative and we could move on. We made an appointment with a new allergist. I explained the extremities of his diet and my goal of hoping to see that perhaps he'd outgrown the allergy. I thought that showing my son he was safe would help him explore new foods. Unfortunately, My plan completely backfired. Not only did the test show that his peanut allergy was literally off the chart, but this time my son was old enough the understand the severity of those numbers. My plan to help alleviate his anxiety about food only caused more. Mom fail. He's even more afraid to try new things and each day I struggle to find the balance between being more strict about food and offering him grace for a real and true food anxiety issue. I don't have the answers. I don't blame the peanut allergy for his picky eating. It certainly doesn't help, but I know it's partly due to the parenting choices we've made when it comes to food. I've just recently become more passionate about my family's health, and habits I've allowed over the years take work to change. Obviously, fruits and veggies don't have nuts. I know this. I'm trying, but I feel like I'm failing and I worry about his health. I see other kids eating their vegetables and enjoying what their parents serve them and my life just isn't like that. Eating out, packing a lunch, or even having snack is an exhausting process. Having an extremely picky eater is a lonely place to be as a parent. No one ever seems to really get it. All the parenting tips I read or hear make me think, "They don't know my son. This would never work." 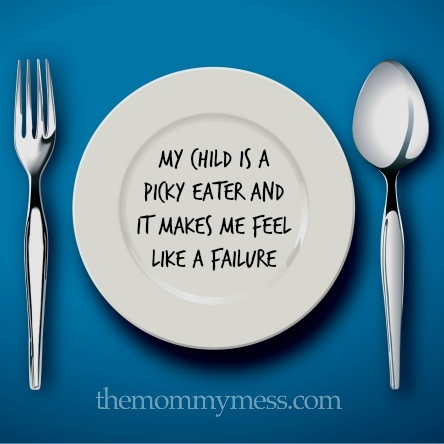 My child is a picky eater and I'm tired and worried and scared and exhausted. Do you have an extremely picky eater? This post is linked up with Shell from Things I Can't I Say, because well, this is all hard to say.